I finished The Hero of Ages (#3) a few days ago: PERFECTION. All trilogies should end like Mistborn did. So. Good. Kelsier, oh Kelsier. What a legend. Criminal mastermind, fatherly figure for Vin, leader of the revolution… he's just brilliant. I genuinely can't remember the last time I encountered a character who's quite as loveable as Kelsier. "Ah, but being an annoyance is something that I am very good at. In fact, I'm far more than just a 'mild' annoyance – people tell me I can be downright frustrating. Might as well use this talent for the cause of good, eh?" "Foolhardy?" Kelsier asked with a laugh. "that wasn't foolhardy - that was just a small diversion. You should see some of the things I'm planning to do! Not to mention all of his thieving crew are awesome too. Breeze, Ham, Dockson… etc. Kelsier's crew are a band of charismatic and charming rogues of the mayhem causing kind. The dialogue between them all is so dynamic and it's great characters like this that make Mistborn such an enjoyable trilogy. Allomancy is perhaps THE BEST system of magic I have ever came across within the fantasy genre. It's the kind of magic system that has me jumping-up-and-down excited – it's just SO original. Okay, so the world-building is IMMACULATE. Sanderson draws the reader in with concepts as intriguing as a world where ash falls from the sky and a swarm of mist creeps up at night. It's so easy to picture each detail of the Final Empire because Sanderson describes them so well. Yet, he doesn't describe them through plain prose, but through the reactions of the characters – the Skaa slaving in the pits as the ash falls upon them & Kelsier training Vin in the mist. Also, LOOK AT THESE COVERS. Gorgeous or what?! The designer did a more than excellent job. This is one of the best aspects of the trilogy. Sanderson has this wonderful way of introducing such intricacies and complexities without falling into the trap of info-dump. And, with books so long, there's certainly a lot of information crammed in without it ever feeling like too much. Seriously, with Mistborn, there's just SO MUCH TO LOVE. As a heroine, Vin is so easy to warm to. She's the underdog – a street urchin who works in underground thieving crews. She's driven by this sheer dose of curiosity (which I can't help but admire!) flawed only by her naivety and stubbornness. Her backstory is also fascinating and, as a protagonist, you can't help but root for her! This may seem like a funny thing to mention, BUT, given how incredibly dull fight scenes can be, Brandon Sanderson definitely writes them with such flair. Part of what makes them so gripping is the way Sanderson combines the battle scenes with allomancy [see point 2]. With this system of magic, the battle scenes flow so beautifully and keep the reader intrigued. Also, the way Vin fights kind of reminds me of Celaena from Throne of Glass! And, yep, in Mistborn, there always is. I have to admit, half the time whilst reading the trilogy I had NO CLUE what was going to happen – and that's so refreshing. Mistborn reaches this wonderful point where it's so endlessly original and well-developed that it can start to have its own inner myths and legends (e.g. the Well of Ascension and the Hero of Ages). And there's something about having prophecies within a story that just makes everything even more magical and even more intriguing. Okay, so I personally love this aspect of Mistborn – it just adds a whole other dimension! You can just tell how detailed Mistborn is when the royalty have a system of houses (Great Houses of Luthadel). And the conflicts between these houses are fascinating! Hearing all the extra info at Royal Balls was so entertaining and made everything feel SO REALISTIC. Also, did you see what I just wrote? ROYAL BALLS. Those scenes were a lot of fun. Mistborn is full to the brim with wacky schemes and plans that are so entertaining to see carried out. If you like complex schemes then you'll love Mistborn! Thanks for making me want to read on in a great series! I hope you continue! 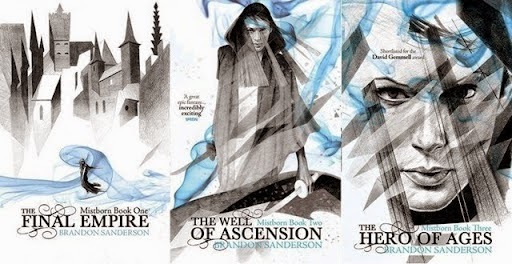 The Well of Ascension and The Hero of Ages are both brilliant – so many amazing twists too! And I'm the same. Well, I still read massive fantasy books but if you anded me a contemporary with 350+ pages I'd be reluctant to read it! SO I SHALL BE GETTING THIS FROM THE LIBRARY IF I CAN. But as soon as you said Kelsier and his crew i thought, STURMHOUND, yes? No? Anyway you've sold me. If my library doesn't have it I will be ANNOYED. I HOPE YOU DO. Tad different to Sturmhound but same charm… this reminds me, I still haven't started Ruin & Rising! Hmmm. These books sound really good, but I'm not sure if it's for me. If you like epic fantasy even the tiniest bit I think you'll enjoy these ones. It also depends if you don't mind MASSIVE books though! I feel as if I read this book that I will be sucked into Another void of obsession. So is the life of a book blogger. Haha I always say I won't get obsessed with things and then I do! I've only read The Final Empire, but I was blown away by it. I've bought the second and third instalments and I can't wait to pick them up! Yay – I hope you enjoy the rest of the trilogy! The other two are equally as mind-blowing! I've only read The Final Empire as well, but I'm planning on reading basically every book Brandon Sanderson has/will produce from the Cosmere. Right now I'm reading Words of Radiance, book #2 from his Stormlight Archive series, and its absolutely amazing. I didn't think Sanderson could get even better after reading his Mistborn book, but he did really, really well with The Way of Kings and now WoR. You should definitely read them if you like his writing. Yep, same! I really need to read all his books! I 100% need to read the Stormlight Archive series – thanks for the recommendation! I'm more of a romance addict than a mastermind/schemes/action addict, so I'm not really sure I'll ever read the series. However, those covers look gorgeous, and judging by your post, Brandon Sanderson has lived up to his standards in this trilogy as well. P.S. Those royal balls definitely sound interesting! Haha the covers are gorgeous indeed! The only Brandon Sanderson book I've ever read is Steelheart. I would say he is a fairly new author to me. You've definitely convinced me to read this book! ALSO THE COVER IS BEAUTIFUL! I'm going start Mistborn as soon as the current load of ARCs lessens and reading your post just increased my anticipation. Also, I read the prologue of The Final Empire and it gave me chills. CHILLS. I think I've been convinced! It sounds like a great series. I'm excited to pick these up! I REALLY WANT TO READ THIS NOW RUBY.